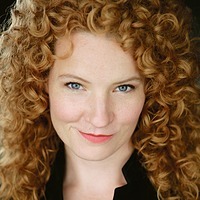 "The undisputed star was the brilliant Abigail Fischer, as Eberhardt. She embodied her character’s restless spirit with a lush, plangent mezzo-soprano incorporating every emotion from anticipation to resigned acceptance." "Abigail Fischer as Eberhardt (she originated the role) had a superb voice and a commanding presence." "Fischer inhabited her role completely, and the composer wrote long, lyrical arioso for her." "The evening’s four vocal soloists gave good accounts of themselves, beginning with mezzo-soprano Abigail Fischer, who duetted affectingly with cellist David Heiss in the 'Pie Jesu' movement of the Requiem, accompanied only by organist David Ralph. Fischer returned in the Haydn to add her strong middle range to the solo quartet...."
"One of the most memorable moments came in the quietest, most tranquil section of the work, Pie Jesu; here we heard only organ, a beautiful cello solo, and our soloist Ms. Fischer, who acquitted herself very nicely in that prayer." "The vocal soloists brought their own choices to the performance, from mezzo Fischer’s warm, compassionate, powerful deliveries... to bass Burdette’s stirringly bold, sit-up-and-take-notice deliveries of movements such as 'Thus saith the Lord' and 'The trumpet shall sound.'" "Eberhardt’s indomitable spirit was channeled through mezzo-soprano Abigail Fischer’s yearning, burning voice and transfixing physicality. Her phrases were voluminous but expertly restrained, and she ascended octaves as easily as a bird taking off. "The opera consists foremost of a challenging role for the mezzo-soprano who represents Isabelle. Abigail Fischer captures this role with astonishing force even though she barely moves—seated on a tall stool at first, occasionally standing or moving in its immediate vicinity, wrapping a shawl around her head like a burnoose worn by a desert nomad (suggesting with this simple image the masculine disguise), and once moving to the piano, sitting down on the bench with the pianist, and playing a melody as she sings. The vocal richness, covering a wide range in both pitch and intensity, focused the viewer’s attention on her throughout.... The individual songs range from elegies and poignant laments to vigorous assertions of personality and energy, and each mood and character was superbly delineated by Abigail Fischer." "The mezzo-soprano Abigail Fischer organized an array of pieces into a new, pan-spiritual liturgy.... Wearing flowing white robes, Ms. Fischer, the mezzo-soprano, walked the aisles and smiled benevolently at the audience as she sang, with a velvety tone, a series of slow-moving, steady pieces." "Abigail Fischer was a strong mezzo soprano.... she dominated her scenes, as she should." "The four soloists, Karen Slack, soprano, Abigail Fischer, mezzo-soprano, Yeghishe Manucharyan, and David Kravitz, baritone, were thrillingly strong in voice ..."
"Abigail Fischer, as Mrs. X.E., has the most complex assignment. She accomplishes a number of protean shifts in her physical deportment, from severe suburban matron to society beauty to trashy talk-show celebrity, commanding the stage at each new incarnation. As far as I could make out, her mezzo-soprano is strong and dark in its lower ranges, while her top has a soprano-like thrust." "Mezzo Abigail Fischer’s wonderfully pitiless demeanor and chilly coloratura set up a Lady Macbeth-like Mrs. X.E."